Instructions: Create a 6 x 6" card base using from white pearlised paper. Cut a piece of paper from the Sweet as Honey Paper Collection 5 3/4 " x 5 3/4 " and adhere to the card base using Dries Clear Adhesive. Line up little smaller piece with the same patterned paper and use hexagon background die to cut and add stamp sentiment from Sweet as Honey Cling Stamp Set. Stamp little crown Honey Bee Maidens Die and diecut using the coordinating dies, colour it using gallery soft pastels. Stamp bees using Sweet as Honey Cling Stamp Set and diecut using the coordinating dies, colour using gallery soft pastels. Adhere to the card base using 3D foam tape for dimension. Stamp the Large Sweet Peony Cling Stamp Set on foam paper with Ranger Archival Ink Pad - Garden Patina and cut using the coordinating dies. Colour with Gallery soft oil pastels 224, 241. You will need 2-3 petals to create each flower. Use an iron or heat gun to heat the petals and then shape using your fingers. Layer the petals together using the hot glue gun making sure to offset them and use a paper piercer to make a hole in the middle and pull through the stamens. Add a little hot glue to the underside of the flower to adhere (watch tutorial). Sponge the petals with dries clear adhesive and sprinkle glitter. 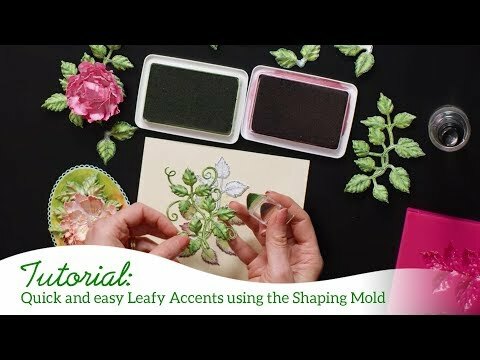 Stamp the leaves using Leafy Accents Cling Stamp Set on the white paper with StazOn Ink Pad - Olive Green, cut out with the coordinating die, shade use this same ink and using the Leafy Accents Shaping Mold. Adhere the flowers and leaves and using a hot glue gun.